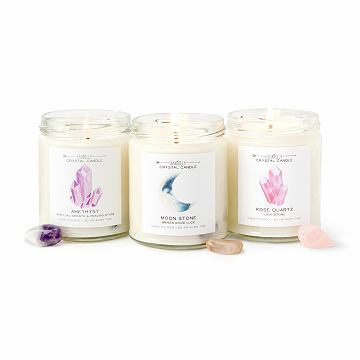 These handmade soy candles each contain a hidden crystal associated with healing, luck or love. There is something beautiful and powerful that lies deep inside each one of us. That's what makes these long-lasting candles such a thought-provoking symbol: as they shine, they gradually reveal a crystal hidden within. You can choose a crystal that is traditionally associated with healing (amethyst paired with the soothing aroma of lavender), good luck (moonstone with floral and citrus notes), and love (rose quartz paired with notes of fig and watermelon). After the crystal is revealed, you can tuck it into a pocket or purse as an inspiring reminder of that symbolic power. Hand-poured in California using 100% American-grown soy wax. Check out our conversation with creator Kelly on the blog. A graduate of California’s Fashion Institute of Design and Merchandising, Kelly Decker began crafting handmade jewelry and soy wax candles as a way to share her passion for creativity and simplicity in design. Inspired by the beauty and hidden meaning of crystals and gemstones, Kelly made them the focus of her work. She launched her business in San Diego, California, in 2014 in an effort to create mindful products that promote serenity and self-reflection, hand-pouring candles and hand-picking jewels in the name of positive vibes for all. Candle is simple in design. Packs a powerful scent for it's size. Candle is a good size and smells amazing! I absolutely love this candle. It burned so nicely, smelled amazing, and brought a noticeably calming energy to my space. I will absolutely buy again as I want them all now! I use this product because the scent is lovely & I want it to fill my home with good vibes. I love the candle because they use soy wax and I'm looking forward to one of us suddenly discovering the hidden crystal! Very pleasant idea behind this product. I have bought the amythist candle again and again! I have not found a candle like this (amythist) that has been more calming than anything I have ever tried or purchased! And this includes many Lavender oils, candles and lotions!!!!! The candles were a gift and they were well received. love the smell of the candle and its not to over powering.